A new study by Washington State University researchers answers longstanding questions about the formation of a rare type of diamond during major meteorite strikes. Hexagonal diamond or lonsdaleite is harder than the type of diamond typically worn on an engagement ring and is thought to be naturally made when large, graphite-bearing meteorites slam into Earth. Scientists have puzzled over the exact pressure and other conditions needed to make hexagonal diamond since its discovery in an Arizona meteorite fragment half a century ago. Now, a team of WSU researchers has for the first time observed and recorded the creation of hexagonal diamond in highly oriented pyrolytic graphite under shock compression, revealing crucial details about how it is formed. The discovery could help planetary scientists use the presence of hexagonal diamond at meteorite craters to estimate the severity of impacts. 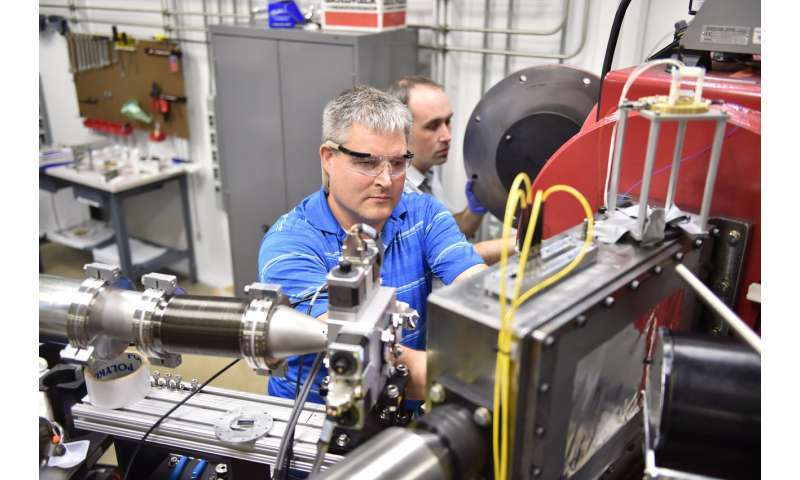 The research was possible because of an unprecedented experimental development-the WSU-led Dynamic Compression Sector at Argonne National Laboratory's Advanced Photon Source. 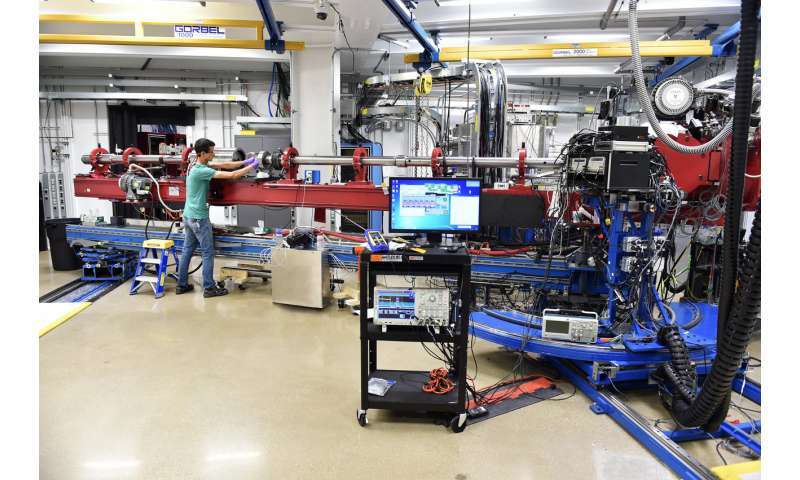 The DCS is a first-of-its-kind experimental facility that links different shock wave compression capabilities to synchrotron x-rays. Using its unique capabilities, the WSU team was able to take x-ray snap shots of the transformation of graphite to hexagonal diamond in real-time. The results of the researchers' work are published in the journal Science Advances. "The transformation to hexagonal diamond occurs at a significantly lower stress than previously believed," said WSU Regents Professor Yogendra Gupta, director of the Institute for Shock Physics and a co-author of the study. "This result has important implications regarding the estimates of thermodynamic conditions at the terrestrial sites of meteor impacts." WSU shock physicist Stefan Turneaure and a team of researchers found that the crystalline structure of a highly oriented form of graphite transforms to the uncommon hexagonal form of diamond at a pressure of 500,000 atmospheres, around four times lower than previous studies had indicated. To obtain their results, the researchers shot a lithium fluoride impactor at 11,000 mph into a 2 mm thick graphite disk. They then used pulsed synchrotron x-rays to take snapshots every 150 billionths of a second while the shockwave from the impact compressed the graphite sample. Their work clearly showed the graphite sample transformed into the hexagonal form of diamond before being obliterated into dust. "Most past research relied on microstructural examination of samples after they were shock compressed to infer what might have happened," Turneaure said. "Such late-time measurements do not tell the whole story of what happened to the material during shock compression." Turneaure and Gupta said the next step in the research will be to investigate under what conditions pure hexagonal diamond can be recovered after shock compression. "Diamond is a material that is very easy to get excited about and our work in this area is just beginning," Gupta said. "Moving forward, we plan to investigate the persistence of this form of diamond under lower pressure. Because it is thought to be 60 percent harder than the common cubic diamond, hexagonal diamond could have many potential uses in industry if it could be successfully recovered after shock compression." To any person who may know, does hexagonal diamond occur naturally on earth ? Also, an empassoined plea to all contributors to avoid saying "three times smaller" and the like - it is nonsense and sloppy, you cannot multiply something by an integer and make it smaller.